I was delighted to find 4 of my images are featured in the 4×4 portfolio section of the Issue 55 of the web based OnLandscape magazine. The 4×4 Portfolios feature four images selected on a “theme of some sort; that hang together in a creative way”. I chose 4 images from my visit to Jökulsárla beach at Jökulsárlón in Iceland last year, where I spent quite a while photographing ice fragments swirling around amongst the shallow waves of the foreshore of the black volcanic beach. The inspiration had come from Lee Frost who had shown a couple of beautiful images of ice amongst blurred water, and these were my attempts at something similar. If you don’t know OnLandscape magazine it’s the brain child of Tim Parkin and renowned landscape photographer Joe Cornish. Tim is the editor of OnLandscape magazine which is published bimonthly online. You can read many articles for free but to gain access to the whole magazine and all the back issues it’s by subscription only. If like me you’ve become a tad bored with the repetitiveness of the current crop of photographic periodicals you may be encouraged by OnLandscape, which tend to present more in-depth and informative articles and so appeal both intermediate and advanced landscape photographers alike as well as beginners wishing to aspire to greater things. 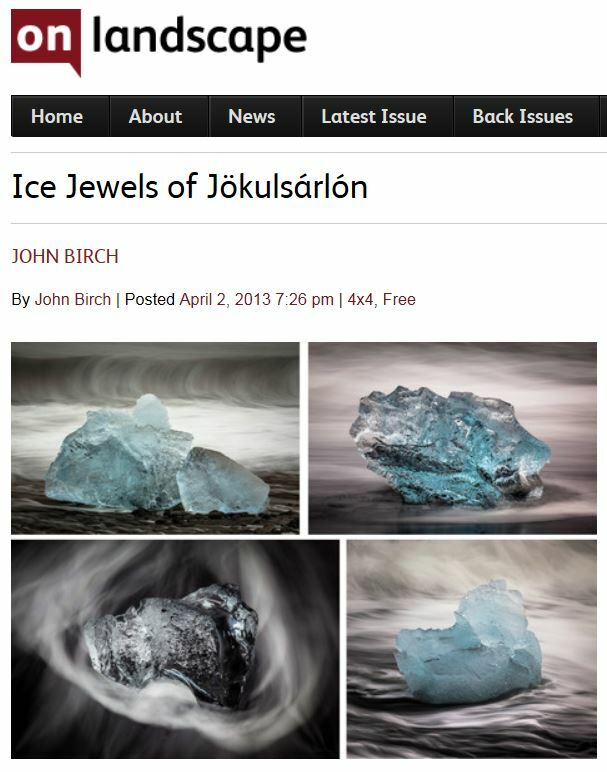 For those of you who don’t yet have a subscription to OnLandscape magazine, there’s a slide show of the Ice Jewels of Jökulsárlón below and with kind permission of Tim you can download a pdf version here. Hi Cassie, the vast majority of my images are RAW files straight from the camera and processed in Adobe Lightroom. A few (mostly older ones) were JPEGs but these also have undergone some reprocessing in Lightroom. Way to go, John! Superb images, my friend.